AND WE BEAT on, boats against the current, borne back ceaselessly into talking about Declan Rice. The FAI’s International Awards bash on RTÉ on Sunday night had a Gatsbyesque feel to them, strictly in the sense that among its main talking points was a central figure electing not to take part. The FAI decided to announce ahead of the event that Rice was voted as the Young Player of the Year for 2018, helpfully confirming that he would not be in town to collect his award. True to form, Rice was nowhere to be seen, and perhaps in years to come we will look back on this whole farrago as one of those deeply strange entanglements of geography, like the twinning of Kildare with Seoul or Kilkenny with the capital of Yemen. There was a further, unheralded mention of Rice as he was announced as a nominee for the senior men’s Player of the Year. Happily, he didn’t win it, although winner Shane Duffy wasn’t around to collect the award, either. In all, nine winners weren’t present to collect their recognition, not even the International Personality winner, given recent criteria seemed to be the dual achievements of a) earning European football success and b) happening to be in Dublin that weekend. This time around, Kahka Kaladze, now the Mayor of Tbilisi, couldn’t make it over. There were some lovely moments. Emma Byrne was deservedly inducted to the Hall of Fame, while Robbie Keane paying testimony to “one of his best friends” Richard Dunne as he was given the same honour. Overall, the whole show was pretty jaded, perhaps because the conversation around the senior men’s team has been so staid of late. With the twin realities of Mick McCarthy’s prolific media appearances and the paucity of actual games, it has felt like the same conversation has been going on for months, centered around Players Who Might Leave Us For England and Players Who Might Leave England For Us. There has also been a small strain of heroic hipsterism intent on interrogating Gibraltar’s Astro pitch. A story about the FAI’s Chief Executive that appeared in the Sunday Times the morning of the awards offered the chance to have a new conversation about Irish football, but John Delaney shirked the opportunity to contribute to it. He sat by Mick McCarthy during the awards without being interviewed, while ahead of the event he entered the studios via a back entrance while a gaggle of press waited for him at the front door. TV Wrap was among them, even if you are surprised he has a corporeal form and doesn’t merely consist of a digitised reservoir of cynicism, tortured hypnosis jokes (you’ll soon see), and jealousy toward Jamie Redknapp. So while Irish football slowly moves on to something else, Matt Williams was on Virgin Media telling Rugby Country it was high time to set their agenda to something new. Matt Williams caught in full flow on Virgin Media. Having spent a long time blathering on about the roof, Williams then said that the country must press the button once marked ‘heresy’. “We need a really honest conversation. It’s a conversation in which we don’t defend”, said Williams, not clarifying as to whether we shouldn’t use the Pendulum Defence, the Umbrella Defence, or any of the other rugby defences called after items found in the office of an Irish hypnotist during the winter. Every time we say something against Joe – because we all love him and respect him so much – everybody defends. We’re not criticising the man and we’re not taking away from any of his achievements, but we are pointing out what Ireland have to do to improve. Schmidt, meanwhile, asked for the “genuine fan” to stick by his team, presumably aware that a ‘Team Of Us’ can splinter only once. In asking the fans to remain on side, Joe might consider reading them another line from The Great Gatsby. Email “TV Wrap: FAI awards a damp squib while the tide begins to turn on Joe Schmidt ”. 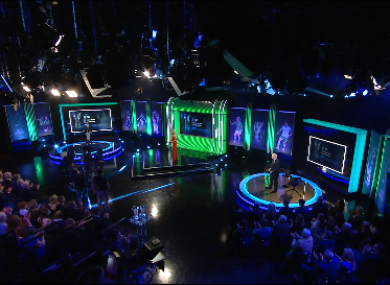 Feedback on “TV Wrap: FAI awards a damp squib while the tide begins to turn on Joe Schmidt ”.